January’s unemployment numbers made it painfully obvious that the government’s unemployment calculations are a mess. In case you missed it: the January unemployment number came in at 9.0%, which is a decrease of 0.4% from December’s 9.4%. But the other interesting statistic in January was the net number of new jobs: 36,000. Now, if 36,000 new jobs can lower the unemployment rate from 9.4% to 9.0%, then 810,000 jobs should eliminate unemployment altogether. And conversely, a loss of 8,190,000 jobs would make everyone in the US unemployed. Put another way, it suggests there are a total of 9,000,000 eligible workers in the United States. But here’s the problem: there are something like 140 million employed people in the US. And if that’s the case, then it should take closer to 560,000 jobs to swing the unemployment rate by 0.4%. Over salads in Palo Alto, a friend and I started talking about online business models. As two serial entrepreneurs (he founded LinkedIn, among others), this is a favorite topic. I’ve used FreeConference.com for years. They provide a great service–scheduling and hosting conference calls. It’s easy to use, and 100% free. But recently I’ve been asking myself: How exactly do they make money? I’ve become so accustomed to free services through the internet, that I tend not to think about them much. Most are either advertising-supported, or they try to upsell you on premium services. But I noticed that FreeConference.com has very little advertising, and never seems to be trying to sell me additional services. So that left me wondering: how exactly do they make money? Fortunately, my friend had led a company in a related space. So he was happy to explain. Another great analysis by USA Today popped up last week: the fraction of individual income earned from private business (as opposed to government wages and programs) sank to the lowest level in the history of the United States. According to their analysis, just 41.9% of US personal income was derived from private wages and salaries in Q1–down from 44.6% in December 2007 and 47.6% in Q1, 2000. At the same time, government wages and benefits have dramatically increased. Why is this significant? Because all government payments come from taxes, which are ultimately derived from productivity in the private sector. So as the private sector shrinks relative to the public sector, the burden on the private sector increases, and the overall stability and sustainability of the system decreases. Using federal bank data, they compared 940 banks in the Troubled Asset Relief Program (TARP) and 7,400 banks outside it. That’s a pretty thorough study. 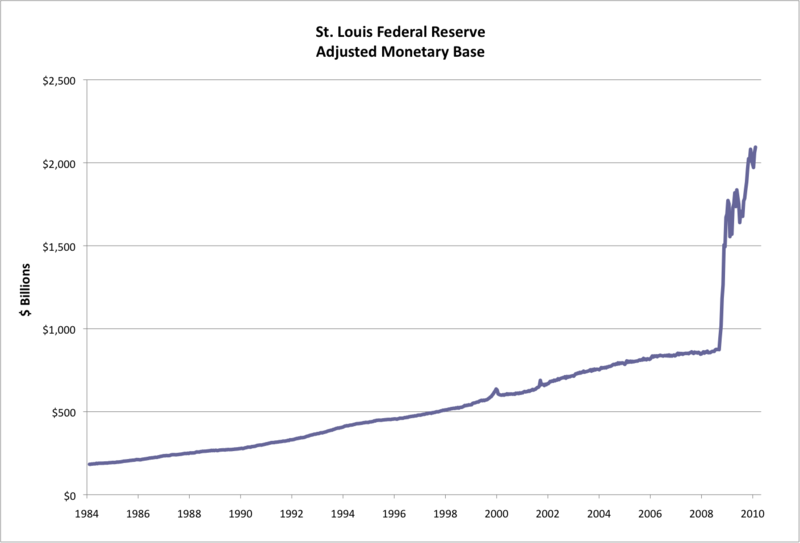 This is the growth of the Monetary Base, as reported by the Federal Reserve Bank of St. Louis. 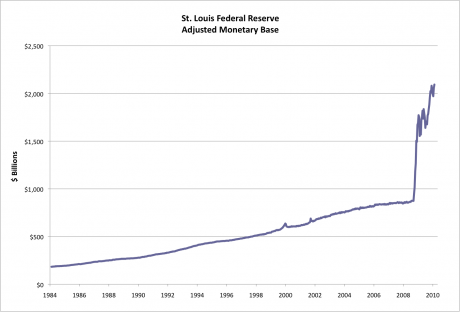 As you can see, the money supply has grown steadily over the years. But in the past 18 months it has more than doubled. G. Edward Griffin’s The Creature From Jekyll Island: A Second Look At The Federal Reserve will profoundly change the way you view the entire banking and monetary system in the US and abroad. It is a fascinating read. The title refers to the creation of the US Federal Reserve Bank, which took place at a then-secret meeting in 1910 (later confirmed by the participants), at a resort on Jekyll Island, just off the coast of Georgia. Most of us grew up thinking of the Federal Reserve as a quasi-government organization that helps stabilize our money supply. How it does that is often a bit of a mystery, although it involves interest rates, and possibly reserve requirements. And it isn’t always clear what the relationship is between the Federal Reserve and the US government. Energy companies can often make a great investment. So it’s worth taking a moment to understand how these companies operate. The US House of Representatives has just approved another $2 Billion for the “Cash for Clunkers” program. Under this program, people will receive $3,500 to $4,500 when they trade in a car and buy a new car that gets better gas mileage than their trade-in did. That covers approximately 500,000 new cars. If you are thinking of purchasing a new car, this may be a nice additional incentive. There seems to be no end to the efforts to rescue dead business models and dying industries. Here’s an interesting graphic (“Turning a Corner?”) courtesy of the New York Times. It shows the pattern of economic cycles, over a period of decades. This graphs plots the relative amount of industrial output against the change in industrial output over a running 6-month period. As you move through the 9 images, you can see how various recessions have progressed. It’s a neat visual, and shows some interesting patterns, but doesn’t provide much fundamental insight.